Many students believe they already know everything there is to know about alcohol before they arrive on campus. However, there are a few common misconceptions about alcohol that are important to address. The reality is that your peers don’t drink as much as you think they do. In a 2014 assessment of undergraduate students, students estimated that 95% of their classmates had used alcohol within the last 30 days when really only 66% had. In fact, over 20% of students reported never using alcohol. Only ONE night of consuming 5 or more drinks can affect your brain and body function for up to 3 days, leading to decreased cognitive performance, lower quality sleep, and a suppressed immune system. So, think twice before partying hard on the weekend… not only will you be putting your safety at risk, you will likely not perform at your maximum ability again until Tuesday or Wednesday (not ideal for those Monday morning exams, let alone studying for them!) If you have 5 or more drinks for TWO consecutive nights, your body can be affected for up to 5 days or almost the entire school week! First let’s define Blood Alcohol Concentration (BAC). BAC is the concentration of alcohol in the blood, expressed as the weight of alcohol in a fixed volume of blood and used as a measure of the degree of intoxication in an individual. The concentration depends on body weight, the quantity and rate of alcohol ingestion, and the rates of alcohol absorption and metabolism. Also called blood alcohol level. 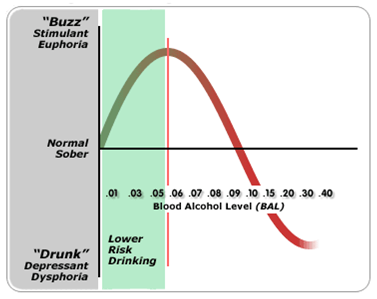 If you consume alcohol in moderation (below a BAC of .06) you can maintain the stimulant phase of alcohol during which you experience heightened mood and relaxation and reduced shyness. But, if you keep drinking beyond this point, you will reach the depressant phase and begin to experience nausea, loss of motor control, decreased mood, impaired judgment, and slurred speech (aka: you will actually feel worse, not better). Don’t believe us? Check out www.thatguy.com to witness the demise of someone that has had too much to drink. According to the Centers for Disease Control and Prevention (CDC), 6 people die each day as a result of alcohol poisoning. Additionally, about half of all fatal traffic accidents among 18-24 year olds involve alcohol. 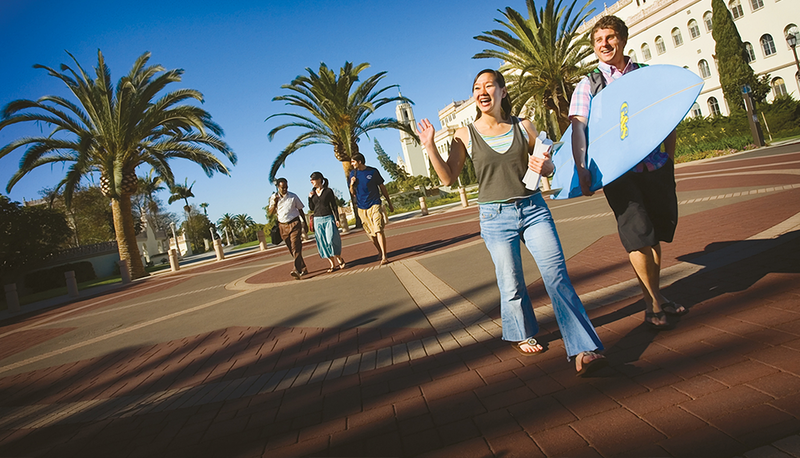 Among USD students, 51% reported experiencing dangerous effects of drinking such as physically harming themselves or another person while drinking in the last 12 months (USD NCHA-II 2016). However, drinking doesn’t HAVE to be dangerous, it just takes a little information and effort to learn to drink moderately and safely, and that’s what this website is all about! Beer may have a lower percentage of alcohol when compared to some other drinks but every 12 ounces (aka one small can) still raises your BAC as much as a 1.5oz. shot of hard liquor or a 5oz. glass of wine. That means drinking 3 cans of beer is the same as taking 3 shots! Yikes! After only ONE drink (BAC approximately .02) it may be more difficult to concentrate and your reaction time is likely affected. It is never a good idea to drive right after drinking even one drink. There is only one thing that will help you sober up and that is TIME. Your body is only able to metabolize ONE standard drink per hour (aka 12oz. of beer, 1.5oz. of hard liquor, or 5oz. of wine) and NOTHING can speed up this process, not even water, food, coffee, or sleep! Have less REM (Rapid Eye Movement) sleep in the second half of the night. Research shows that REM sleep cycles are especially important because they help people to remember and process information that they’ve just learned. In fact, full balanced cycles of REM are needed to keep us well rested and ready to face each day.